I was in my vegetable garden early this morning - meaning after 10 am when it's nice and toasty - contemplating what to grow this year. The usual lush greens of various plants and veggies gave way to mostly brown with a hint of mustard greens and edible chrysanthemum. I suddenly thought of brussels sprouts and how my girls would be so excited to see their favorite vegetable flourishing right now. My girls won't mind if I feed them brussels sprouts every day, but it has to be cooked in a certain way. 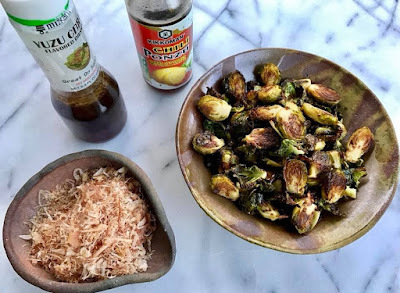 In a previous post, I shared with you one of my girls' favorite brussels sprouts dishes (click here for the recipe). But there's one more - deep fried or roasted in the oven, then topped with dried bonito flakes (pinkish-tan flakes of dried skipjack tuna), or furikake (seasoning made from combining sesame seeds, sugar, dried and ground fish, chopped seaweed, and salt), crispy rice, and drizzled with sriracha aioli or dipped in ponzu sauce. Can you smell it yet? Surely, deep fry food are unhealthy, but it's so decadently delicious. I do limit the amount of fried food my family eat. 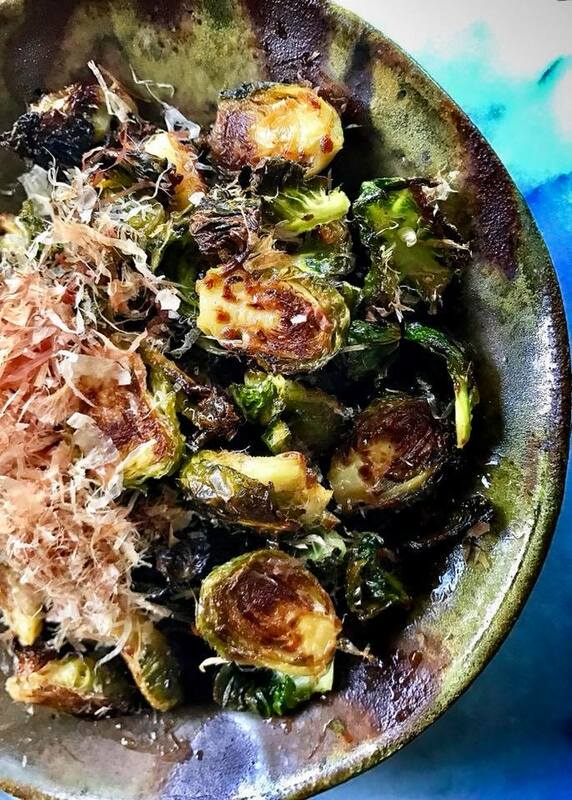 But honestly, I like brussels sprouts best when they're deep-fried. 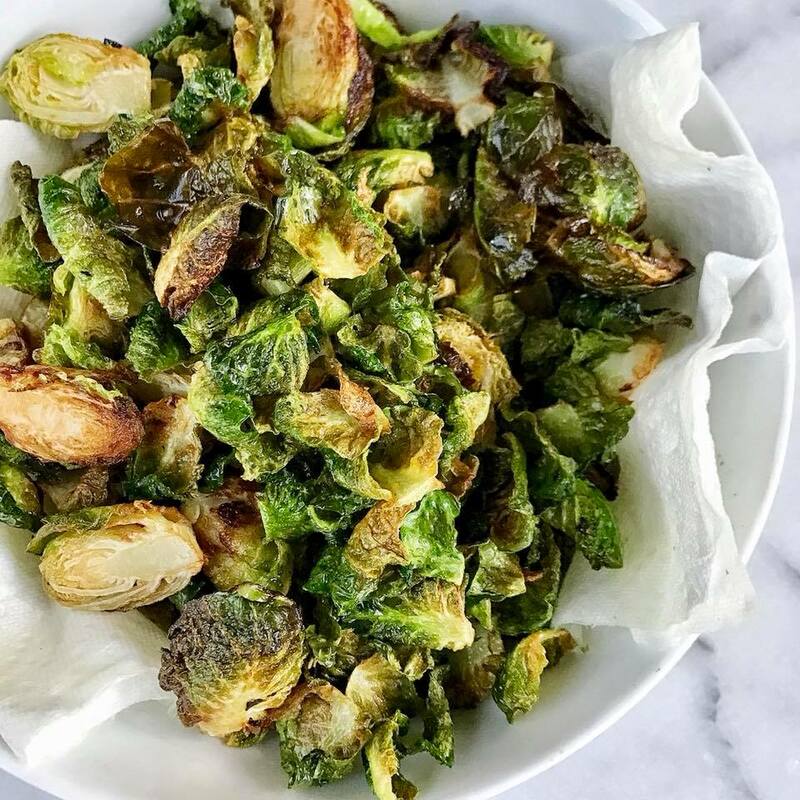 It brings out a wonderfully sweet and nutty flavor from the brussels sprouts, making them irresistible. 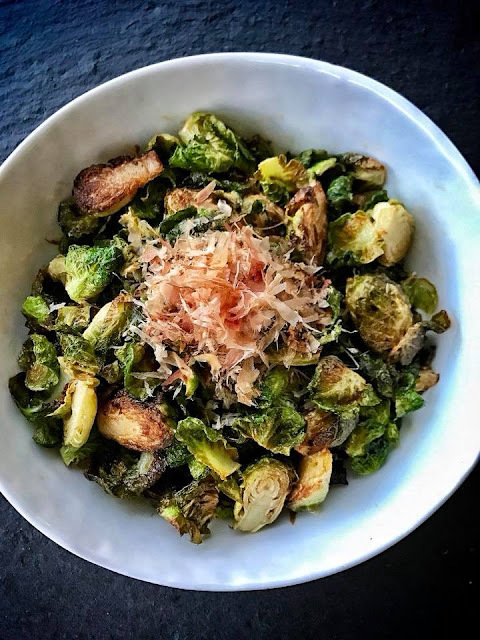 I get that not everyone is a brussels sprouts fan, but that may change after you venture to try this recipe. 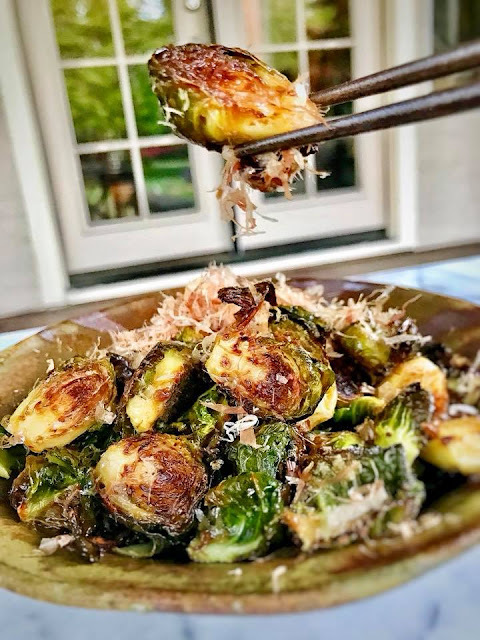 My girls love brussels sprouts with crispy rice. Their faces become animated as they are popping the crispy rice in their mouths. If you use the crispy rice in this recipe, spread cooked rice out on a tray and dry the rice at 250° for approximately half an hour. I purchased a 2 lb bag of brussels sprouts from Costco. They're already pre-washed. 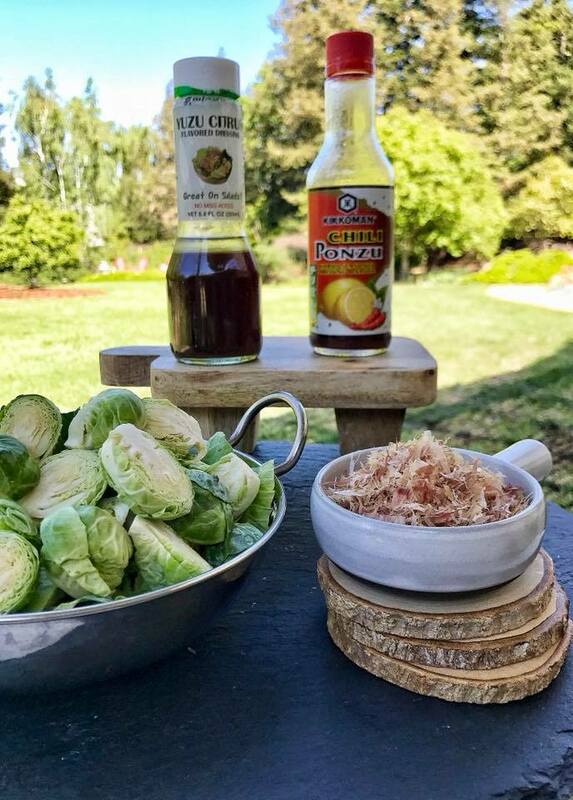 Cut off the brown ends of the brussels sprouts and pull off any yellow outer leaves. 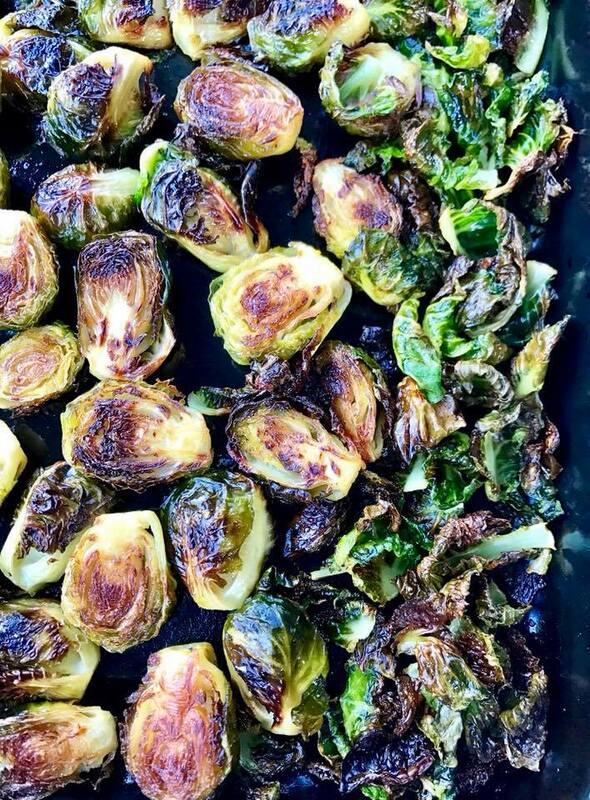 Keep the loose green leaves separately because they get all crispy and delicious when roasted, and the texture is incredible. Cut each into halves. Make sure they are dry at room temperature. Brussels sprouts that are cold or damp will bring the oil temperature down and the sprouts won't be crispy. 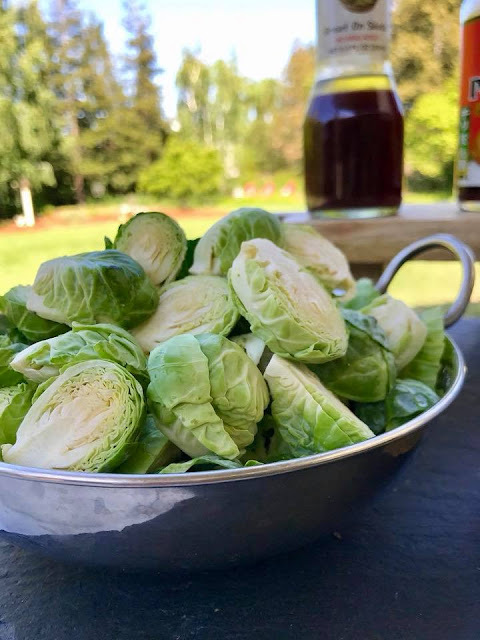 Brussels Sprouts - line a large plate with a double layer of paper towels. In a pot or deep pan, heat oil on medium high. When the oil is hot or reach 400°F, add brussels sprouts. Oil temperature will drop, so adjust heat to maintain this temperature. Be careful, as the oil can splatter. 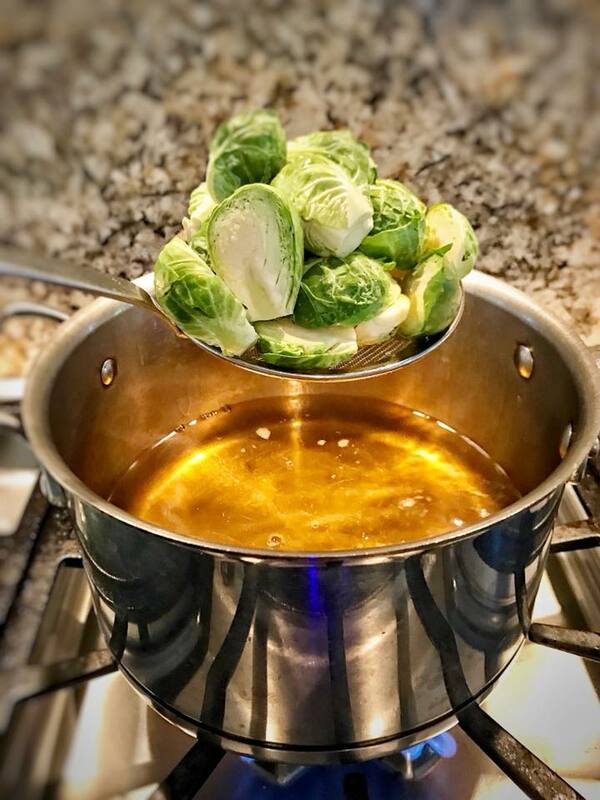 Fry and stir with a slotted stainless steel spoon until brussels sprouts have a nice golden brown color; usually takes about 3 minutes. Transfer to paper towel-lined plate to drain any excess oil. If you prefer to bake brussels sprouts, preheat oven to 450°F. 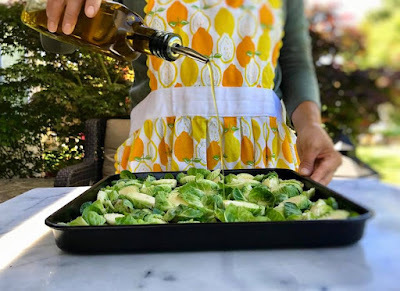 Mix brussels sprouts with the olive oil on a baking tray. Roast for 35 to 40 minutes, until crisp on the outside and tender on the inside. Shake the pan from time to time to brown the sprouts evenly. Rice - fry the dried rice. 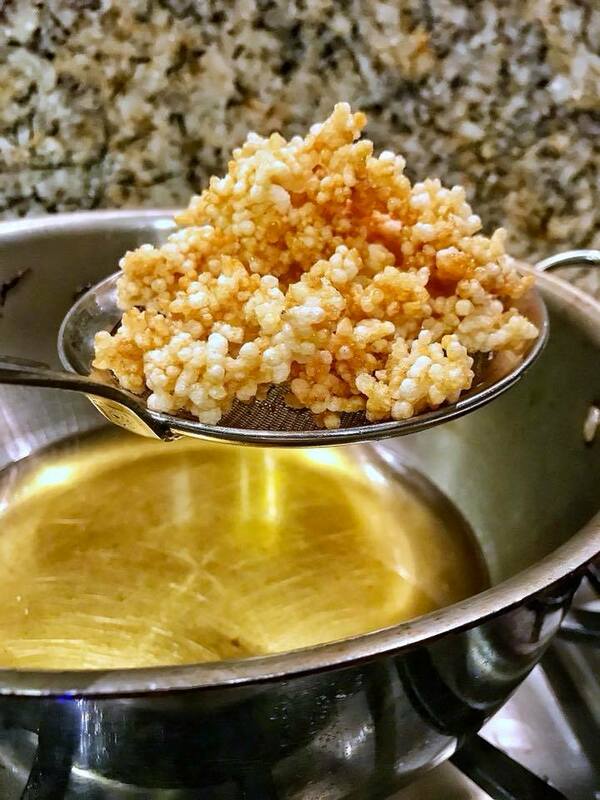 Once the grains of rice are popping and turns golden brown, carefully use a strainer to remove the popped rice from the hot oil. Place the popped rice on a paper towel to allow any excess oil to be absorbed. In a bowl, toss brussels sprouts and crispy rice, if used, to combine. Set aside. 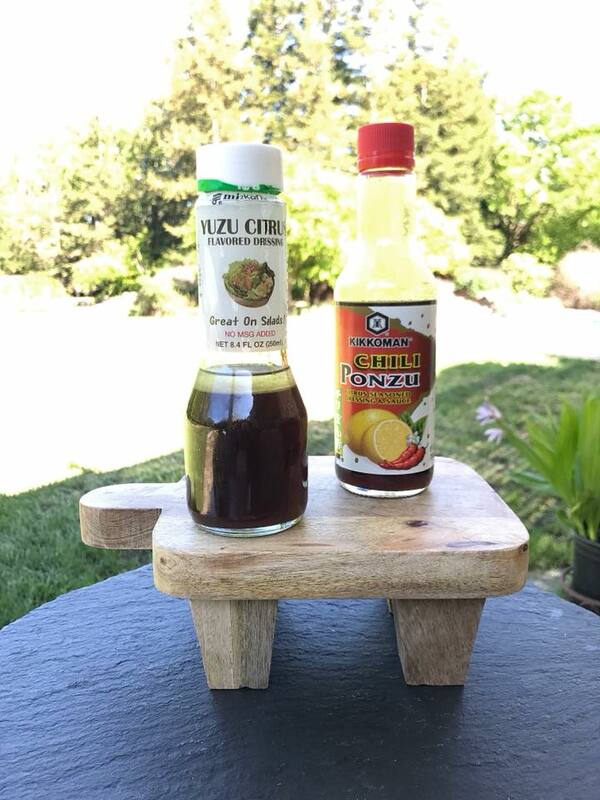 Mix half of ponzu sauce and yuzu in a small bowl. Set aside. If you want to try sriracha aioli sauce, stir 1/4 cup of mayonnaise and 1/2 tablespoon of sriracha hot sauce together in a bowl until the color is consistent; add about 1/4 lime or lemon juice and stir. 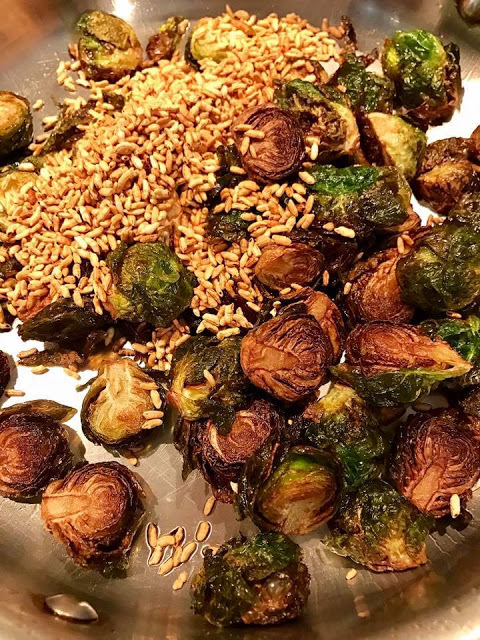 Transfer brussels sprouts and crispy rice to a serving plate. Pour the sauce on the bottom of the plate so that brussels sprouts will not get soggy and become salty from soaking in the sauce. Top with dried bonito flakes. Serve immediately.